Always a cool head in a tight spot, Colonel Benjamin Grierson found a way to help General William T. Sherman hold onto his. A dicey incident on the Western plains five years after the Civil War did nothing to lessen Sherman’s soldierly regard for Grierson. At Fort Sill, Oklahoma, in May 1871, Grierson found the perfect opportunity to repay the general for his kind words and good opinion. Always a cool head in a crisis, Grierson’s quick actions that day would help Sherman hold onto his. By then Sherman had succeeded his good friend Ulysses S. Grant, now President Grant, as commanding general of the U.S. Army. 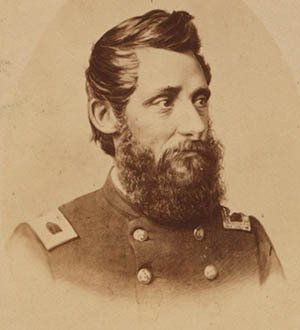 Through Sherman’s personal intercession, Grierson obtained command of Fort Sill, leading the all-black 10th Cavalry Regiment in the ongoing campaign against restive Native Americans on the plains. Sherman had gone west to investigate recent depredations by Kiowa and Comanche Indians, who were leaving the sanctuary of their agency near Fort Sill to raid white settlements and wagon trains across the border in Texas. It was all part of a long-standing game—albeit deadly serious at times—for the Indians, but Sherman did not find it amusing. Upon his arrival at Fort Sill, he demanded to see the principal Kiowa chiefs and hear their version of events. Chiefs Satanta, Big Tree, Satank, and Chief Lone Wolf rode into Fort Sill on May 27 to confer with the distinctly unamused Sherman and, not coincidentally, to draw more free government rations of sugar, coffee, and beef for themselves and their tribe. Satanta, the leader of the delegation, considered himself a diplomat as well as a warrior. He once had praised George Armstrong Custer, in all sincerity, as a “heap big nice sonabitch.” Now he turned his diplomatic skills on the scowling Sherman, who met the Indians on the front porch of Grierson’s headquarters. Sherman unsurprisingly disagreed, underlining his frank difference of opinion by ordering the immediate arrest of Satanta, Big Tree, and Satank. Satanta, throwing off the blanket he was wearing, grabbed for a pistol. The others followed his lead. Sherman, having anticipated the move, shouted an order and the shutters on the porch windows flew open, revealing several soldiers from the 10th Cavalry, their carbines aimed steadily at the Indians. “Don’t shoot, don’t shoot!” Satanta cried. At that moment another Kiowa chief, Lone Wolf, came riding up, a bow and arrow in one hand, a Winchester rifle in the other. He took a seat on the porch, handing the bow to a tribesman named Stumbling Bear but keeping the cocked Winchester on his lap. Stumbling Bear, perhaps misinterpreting Lone Wolf’s intentions, suddenly drew back the bow and aimed an arrow at Sherman. Another Indian hit his elbow, deflecting the shot. Lone Wolf leveled his rifle at the startled general, but before he could fire, Grierson alertly jumped onto the chief, knocking him to the floor. The Indians were led away in chains and Sherman was left with yet another reason to value the quick-thinking, quick-acting Hoosier cavalryman, who had saved him that day from certain death. Tags Benjamin Grierson, Chief Lone Wolf, Fort Sill, general george armstrong custer, Satanta, Ulysses S. Grant, William T. Sherman. 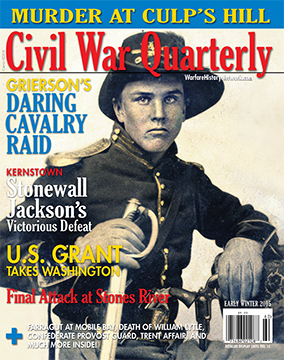 Ben Grierson was one of the finest Cavalry man next to John Buford this country ever produced. You must be a Southerner Jim.